2. They live here too. 3. It’s the least they can do. But really, folks, anyone over the age of four living under your roof can and probably should contribute to your household in some way. Kids are capable, and in some cases, willing to help out however and wherever they can. The trick to raising kids who help around the house is twofold: One, start ‘em young; and two, accept the reality that each chore will take five times as long, require your help, and will not be performed to your standards – but so what? Your kid is trying, and as they grow older they’ll refine their skills and be able to help you in real and meaningful ways. I’ve never paid my kids to perform basic household chores. Personally, I feel like an allowance should be earned for efforts exceeding the very basic functionality of our home. My job is to provide and care for my kids in the ways they cannot – not work as their maid, personal assistant, and general gopher gal. 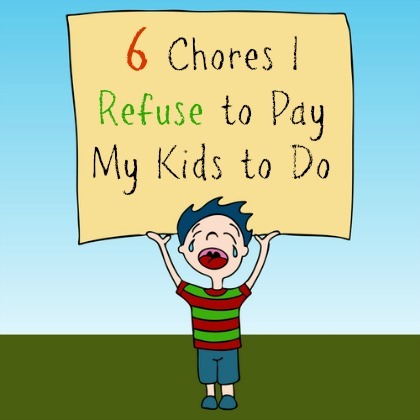 Check out these 6 chores I expect my kids to do for free, because they live here too.